From a tablet, smartphone or PC, you can play the same song on one or many speakers or play different songs on different speakers. You can also set each speaker to play at different volumes, perfect for entertaining or individual listening. 1) You can play a song on one speaker or. 2) You can play a song on many speakers. 3) You can also play different songs on different speakers. 4) You can also set each speaker to play at different volumes which is perfect for entertaining or individual listening. 5) You can use different a smart phone (or tablet) playing different songs to different speakers at the same time. The higher bandwidth of WiFi offers higher sound quality (up to 24 bit / 192KHz), a longer range with less dropouts, and multiple speaker practicality. Qualcomm® AllPlay™ offers a world of music and content, whether its streaming music services, internet radio or music from your own library. Wireless speakers and audio devices that use the Qualcomm® AllPlay™ smart media platform can work together seamlessly regardless of product brand. With Dual Band 5GHz/2.4GHz Wi-Fi, connect more speakers with less interference. We all know that Sound Quality is a subjective thing. One person's perception may be different to the next. So let's measure this in tech. Music transmitted to WiFi speakers is uncompressed (called lossless). Yes, the files are bigger but then so is the amount of musical information. Wifi Speakers can reproduce music with up to 24bit / 192kHz which is in fact which is the quality of high end audiophile sound systems. Unlike Bluetooth (which uses some nifty A2DP compression codecs), music on WiFi speakers is clearer with better sound reproduction especially in the high and low range (trebles and bass). Compared to Bluetooth, WiFi speakers don't suffer from dropouts and have a wider range (so you can move around the house whilst still listening to your tunes). Furthermore, the LASER WFQ10 is equipped with 802.11 a/b/g/n fast WiFi with a high quality onboard D/A and amplifier producing 20 watts RMS through 2 full range speakers and a passive subwoofer.... all in stereo. Like they say, you've got to hear it to believe it. Coming soon are more Qualcomm® AllPlay™ speakers including large room speakers (30watt and 50watt) as well as soundbars, subwoofers and portable units. From a tablet, smartphone or PC, you can use the Qualcomm Allplay app (iOS or Playstore) to play music across your WiFi speaker setup. You can play a song on one speaker or you can play a song on many speakers. You can also play different songs on different speakers. You can also set each speaker to play at different volumes which is perfect for entertaining or individual listening. A maximum of 10 Allplay™ speakers can be connected with no additional hub or hardware required. Wireless speakers and audio devices that use the Qualcomm® AllPlay™ smart media platform can work together seamlessly regardless of product brand. So even if you decided your next WiFi speaker was going to be a different brand, then so long as it has Qualcomm Allplay, it will work on your existing network. Likewise if you already have an Allplay speaker, simply add one of the LASER Allplay speakers to expand your WiFi speaker system. Over 100,000 real radio stations and more than four million podcasts from all over the world. Sports, news, music and talk radio for wireless audio equipment enabled with the Qualcomm AllPlay smart media platform, all powered by TuneIn. AllPlay Jukebox is designed exclusively for use with wireless audio equipment enabled with the Qualcomm® AllPlay™ smart media platform. Use AllPlay Jukebox to connect to compatible devices, choose audio sources, create playlists, select connected speakers for playback and stream audio wirelessly to any or all available speakers in standard, multi-zone, or party mode configurations. Qualcomm® AllPlay™ offers a world of music and content, whether its streaming music services like Spotify, internet radio like iTunes Radio or music from your own library. Use DLNA to connect to music sources which are connected on your DLNA enabled network (such as from NAS drives or PC's). In fact, different users with their own smartphones / tablets can access any of the Allplay speakers and send their own music to that speaker. Dual band is the capability to transmit on the 5 GHz band of 802.11a and also the 2.4 GHz band used by 802.11b, 802.11g, and 802.11n. Unlike ordinary Wi-Fi equipment that only supports one signal band, dual-band gear contain two different types of wireless radios that can support connections on both 2.4 GHz and 5 GHz links. What is a true Wi-Fi Multi-room System? Some brands on the market sell themselves as Multi-room speakers but not all products are the same. The Qualcomm system is a true Wi-Fi Multi-room system. Why? You don't need a Wi-Fi gateway adaptor to connect your speakers. Our speakers each have dual band Wi-Fi and connect individually and directly to your home Wi-Fi Modem/Router. You can connect 10 or more speakers. Simply take your speakers out of the box, connect them to your home router and you have a multi-room system with up to 10 speakers around your home. Some brands use Bluetooth to connect to their speakers. This has numerous disadvantages. 5) There can be interferance over the network. Bluetooth to R/F or Bluetooth to Wi-Fi. Most importantly, streaming by Bluetooth can be tough on your phone, which has to simultaneously download music using Wi-Fi while it broadcasts it out again to the speaker using Bluetooth. With Laser Qualcomm WiFi speakers your phone merely controls the music, so it's not going to overheat or drain its battery with constant work. Secondly, Bluetooth is flaky. You need to leave your phone close to the speaker at all times to avoid drop-outs, and if you continue to use your phone while the music is playing you risk juddering or having your phone's audio (from, say, notifications or videos) coming out through the speaker. By contrast, once the music is playing through the Qualcomm APP, Spotify, Pandora, whatever — you can take your phone around the house or outside, play a game or watch a video and there's no interruption. A review about Qualcomm Allplay speakers written by Anshel Sag, Moor Insights & Strategy technologist and staff writer. "From my experience, AllPlay speakers are an absolute must have for anyone that likes having high quality music around their home and likes to be in control. ?The beauty of the AllPlay platform is that it allows you to mix and match manufacturers without much concern for compatibility, which is great." Review of the WFQ10, as reviewed by the highly popular Impulse Gamer (gaming) website. Review on Techguide.com.au by its editor, Stephen Fenech. Review on EFTM.com.au – Everything For The Man, and written by Trevor Long. Welcome to next generation wireless music. 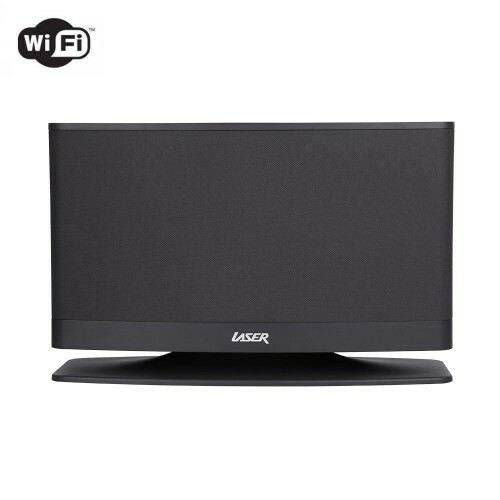 The LASER WFQ50 WiFi speaker offers better sound with no dropouts. Stream music though Spotify from a smartphone, tablet or PC. Play your music in one room or multiple rooms with all the benefits of Qualcomm's Allplay ecosystem. The benefit of the LASER WiFi music systems is that you don't need a "bridge" WiFi device. Our WiFi speakers connect directly to your WiFi network and can be controlled via any smartphone or tablet. Download the app (iOS and Android) to send music from streaming services, your own playlist or Internet radio to one or many speakers (Whether it's LASER branded or other Qualcomm Allplay brands). You can play one song or multiple songs across a variety of speakers and brands and all at different volumes. Say goodbye to cables and wires and put your old Bluetooth speaker away. WiFi speakers are the future of music. The full range of Multi-room Wifi speakers in our range include can be viewed here with more models to come. Speakers (Full Range) 2 x 5"